The summer season runs June-August (7am-9am). 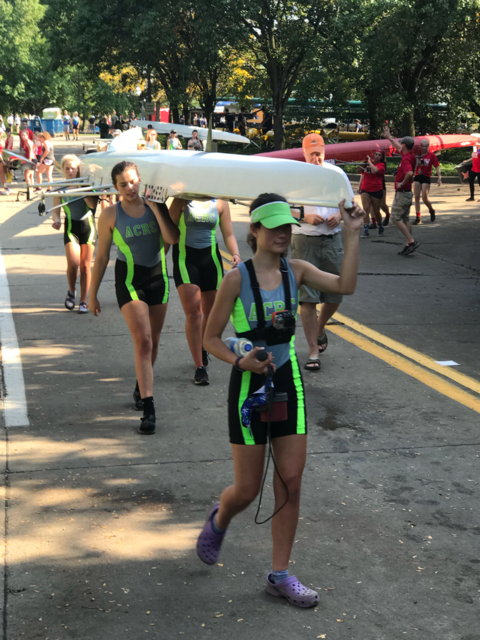 Rowers will enjoy summer on the water at Alum Creek Lake along with fun outings to promote team-building and overall fitness. ACRC's Learn-to-Row program introduces kids, ages 12-18, to the competitive sport of team rowing. New LTR sessions begin every Monday morning, 7am-9am, beginning in June. Learn more here. Rowers will move indoors during the winter months to row on ergs (rowing machines) and develop other muscle groups through weight training and yoga. Erging allows coaches to work one-on-one with rowers to improve technique and build endurance. The fall season runs from September through early November. Fall regattas are typically 5,000 meter races depending on the venue. Training carries over from the summer season and focuses on endurance for the longer races. The spring season runs from March through May. Regattas are 2,000 meter side-by-side sprints, requiring strength and fitness. Weather permitting, workouts are on the water. The season culminates at Midwest Junior Championships, typically held the third weekend in May. The top three boats in varsity races are invited to the US Rowing Youth National Championships in June.